NEW YORK, NY, May 7, 2013 — For the third consecutive year, Precision Metal Industries has been selected for the 2013 Best of Pompano Beach Award in the Precision Sheet Metal Fabricator category by the U.S. Commerce Association (USCA). The successful companies on this list come from all industries. They are all headquartered in South Florida, been in business at least three years, and have all generated at least $1 million in revenue. Most importantly, they all showed significant revenue growth. Each company on the list increased its revenue by more than 25 percent over a one-year period. For the second year in row, this award was presented to Gregory S. Wilson in recognition of outstanding leadership, dedication, determination and entrepreneurial success. Each year, Business Leader recognizes the top entrepreneurs of the South. Winners are entrepreneurs that have created companies that contribute to their industries and business communities. This honor is presented to dynamic and visionary business leaders who are guiding their companies to great success. They are considered progressive, innovative leaders who are trendsetters in their industry. PMI is honored to be considered for the third time as a finalist in this competition. We are all thrilled to be recognized for our hardwork and dedication to excellence. There is a stringent qualification process for this recognition, and we consider it a great acheivement! Precision Metal Industries, Inc. has been recognized by Inc. Magazine in their annual Inc. 5000 list, an exclusive ranking of the fastest-growing privately held companies in America. PMI is ranked NO.3361 on this prestigious list, which is considered a hallmark of entrepreneurial success. This achievement puts PMI in rarefied company, especially if you consider that there are nearly 7 million private, employer-based companies in the U.S.A. Past members of the list include Intuit, Zappos, Under Armour, Microsoft, Jamba Juice, Timberland, ClifBar, Patagonia, Oracle and Zipcar. 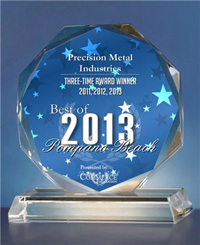 For the second consecutive year, Precision Metal Industries has been selected for the 2012 Best of Pompano Beach Award in the Sheet Metal Work category by the US Commerce Association (USCA). Nationwide, only 1 in 70 (1.4%) 2012 Award recipients qualified as Two-Time Award Winners. The USCA “Best of Local Business” Award Program recognizes outstanding local businesses throughout the country. These are local companies that enhance the positive image of small business through service to their customers and community. PMI was named as one of South Florida’s 50 Fastest Growing Companies. The list highlights companies with the highest growth in revenue within the region. Precision Metal Industries was honored to receive a Lockheed Martin Small Business of the Year Award for Continued Excellent Service. PMI was recognized for our high level of contributions as a supplier. PMI is a company is committed to sustaining excellence and quality in every aspect of manufacturing operations– including superior customer service. To be considered as finalists in such heady competition is a great achievement. PMI was pleased to be recognized for our hard work, reflecting every single employee’s devotion to their job, inventiveness and dedication to excellence.